The following is an interview with St Kevin’s Boys (SKB) Head Club Coach, Alan Caffrey, on his trip to Barcelona, where the SKB U12 Premier Team mixed it with some world class academy teams in the 2015 Torneo Alevin de Navidad, sponsored by Powerade. They are the only team from Ireland or the UK to be invited to this prestigious tournament. As one of the top schoolboy clubs in Ireland, how does the standard differ to Europe’s finest? I would say when we play local clubs across Europe we are there or thereabouts in terms of football, but when we step up and play top academy clubs like Barcelona, Ajax and Real Madrid, you can see the difference in terms of their technique and the importance of first touch; tactically, [with] their understanding of movement and the shape they are playing; and physically, with how quick they cover the ground, and their use of their body. The other big thing is the love for the game these players have, and it’s all they do all day every day. What Teams were in the tournament and who was in your group? We had Barcelona, Real Betis, Maccabi Haifa, Reus, Lieida; also Real Madrid, Sevilla and Villarreal – all the top Spanish clubs were in it. [We played] Reus, Lieida, Real Betis, Maccabi and Barcelona. SKB run a very successful tournament every Easter, in which you have a big part in organising. How would you rate this as a tournament, and is there anything you can take from it which you can bring to your own tournament? At SKB, we always look to get the best teams for the Academy Cup, for two reasons really: firstly, we always want to test our boys against the best in Europe; and secondly – we feel we have a responsibility to show the rest of Ireland the standard of football across Europe. The Academy Cup is now seen as one of the best U13s tournaments in Europe now, and 2016 won’t disappoint. We will introduce three-quarter-size goals this year. What game did the SKB players most look forward to playing, and why? I think every player dreams of playing against Barcelona, and the reason being is that we talk to our players a lot about pushing themselves and testing themselves, even in defeat – can we learn a lot about ourselves, and what we have to do to get to that level? And I include the coaches in that, too. What differences did you see between the Irish and European player? I think I said it earlier – they seem to have a real love for the game and the club they are with; there is no GAA or Rugby or any other outside interference, they just love the club they play for and don’t have the worry or the pressure of trying to get into any representative teams which is a problem in Ireland. There should be no representative teams until International football at under 15s, where the best come together and play. There is no reason to have it any earlier. Did this trip open your eyes to the changes needed in the Irish game at youth level? Any visit I personally go on I always try to take something back that we can [use to] help our players. If we take our standard at SKB to the level of football in this country, then Irish football is going nowhere. We have to keep pushing ourselves as coaches and as players, both on and off the pitch. What do you think is the most important thing that needs to be change in the Irish game? I think we should stop trying to be like other countries and keep our identity of a hardworking and winning mind-set, and then add to that. Yes, we have to be technically better; yes, we have to be tactically better [with] a system that suits the players in your club ( the Spanish teams that we played, all played different systems that suited their club). From a physical aspect we have a lot of work to do but I would say the players and parents have a big responsibility too. Our players spend more time on their PlayStation these days than with a ball on the street. It all has to start in small-sided games – from ages 7 to 12 – with good coaching, and making sure the players understand the game. In Spain they play offsides in small-sided games; the players and the coaches are very competitive. I watched a mini El Classico at U11 and it was like watching the real thing, the standard of football was excellent – when goals were scored they were celebrated by everyone, coaches included. After the game the players were doing interviews with Barca TV to be shown later that night. We need to be careful with the attitude of just sitting back and letting the kids play, because Spain is setting the standard in youth football, and this is something they don’t do. You would bring a lot of SKB teams away to play English academies – how does it compare to playing against academies from the rest of the world? We play some very good Academies at all levels in England that have a very good record at producing players for their own clubs and it is so important that we give players this experience as this is where they all want to play. Not very many players want to grow up to play in the LOI. But when we play against the likes of Barcelona, Real Madrid or Ajax, it’s a different kind of football experience we get, and it’s an education for players and coaches to be part of. This sort of experience will stand to our young players when they get older, as we are seeing with some of Ireland’s best Internationals going up against some of Europe best players and holding their own – for example, Jack Byrne playing every week in the Dutch League at 19 years old; and we have all seen what a big part Robbie Brady and Jeff Hendrick have played in getting Ireland to France. But overall, I would worry about the future Irish International player in five year’s time. 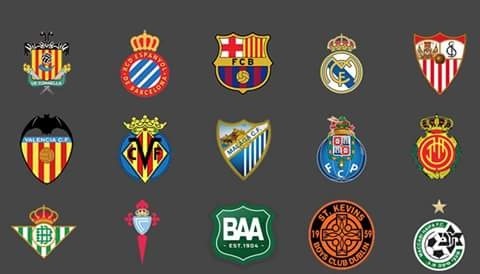 If you fancy taking on the La Liga giants in some of DB Sports Tours Invite only La Liga tournaments contact us today for further information on info@backmain.dbsportstours.com. Don’t forget to keep an eye on the upcoming blog as FC Dallas take on the best Spanish academies. If you are interested in finding out more about how DB Sports Tours can help your club to experience the international soccer community to the highest level, then contact us here for more information.